In the spirit of the Christmas holiday and in honor of Nelson Mandela's vision for a rainbow nation, and, perhaps even a rainbow world...here are some findings from genetic research on how genetically similar humans across the globe actually are. Research by Dr. Luca Cavalli-Sforza at Stanford University in the US on a variety of genes in a broad range of human populations highlights our common humanity, rather than our differences. The graph shows how patterns in the differences among people in well-studied genes rarely match our understanding of races. Most (around 85%) of the dissimilarity in genes is between individuals in a single population (such as a province or country), and less than 10% of our genetic differences are primarily between populations on different continents. While there are still genetic tendencies among populations and ethnic groups, we humans are, apparently, really homogeneous. One group of 55 chimpanzees, our closest living relatives, in West Africa shows more genetic diversity than our whole species. In other words, some chimps in that group are more different from each other than you or I are from any other person on Earth. The relatively small genetic differences between people tend to be seen in traits that have allowed particular groups to better succeed in their different environments, for instance by resisting local diseases or other environmental conditions. Human skin color is one of these. 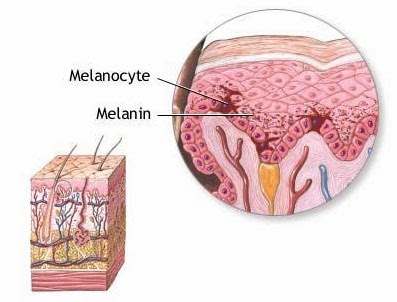 Special cells called melanocytes in humans and other animals produce a pigment called melanin, which absorbs ultraviolet (UV) light and decreases the penetration of UV radiation into the skin. This process protects us against the cancer-causing damage from UV light and the loss of folate, a key B vitamin that is lost after prolonged exposure to strong sun. Melanin also absorbs and reflects visible light, so skin (as well as hair and eyes) that produces more melanin looks darker. People all over have similar numbers of melanocytes, but the melanocytes in those with darker skin turn on more melanin, so darker-skinned people have better protection against damage from strong sun. Sunlight is strongest in the tropics, and, as you might expect, people in the tropics tend to have darker skin. 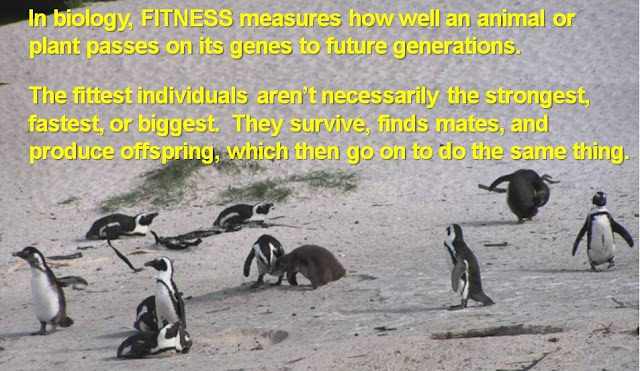 As we know from natural selection, the traits of people (or animals) who survive longer and reproduce more tend become more common in a population, so darker skin must have been beneficial for people living in tropical regions. Research indicates that the ancestral skin of modern humans was dark and likely compensated for the loss of thick body hair (think chimpanzee) in the sunny climate of eastern Africa, home of our earliest common ancestors. Light-colored skin produces little melanin pigment and thus, much less protection from sun damage, which is why fair-skinned people in the tropics tend to suffer much more from skin cancer. Albinos – people whose melanocytes synthesize little or no melanin and so have little color in their skin, hair, and eyes – are highly susceptible to skin and eye diseases, so you can see why having more melanin would be important in sunny places. So why does anyone have light skin? We need vitamin D to absorb and process calcium, and we synthesize vitamin D from sunlight. People living far north of the equator, where daylight is weakest, may have evolved fair skin to help absorb more of the limited ultraviolet light there and avoid vitamin D deficiency. Similarly, adult women tend to have lighter skin than men, which allows their bodies to absorb more calcium needed during pregnancy and lactation. Although the different versions of the gene that helps produce melanin lead to different skin colors, these difference aren't linked to variations in any other known gene. So skin color doesn't represent some underlying division among people – it mainly helped different groups adapt to different levels of sunlight. A random mutation of one of the genes for hemoglobin (the protein that carries oxygen in the blood) twists and weakens red blood cells, causing sickle-cell anemia, a blood disease found mainly in black-skinned people, especially those who live (or whose ancestors lived) in Central and West Africa. It turns out that the mutation also protects against deadly cerebral malaria, and it persists where malaria is rampant (map on the left) because malaria parasites can't survive in sickle-shaped blood cells. A child born with one copy of the gene (i.e. from one parent) has substantial immunity to malaria and only some deformed red blood cells. Although a child born with two copies – that is, one from each parent – usually develops anemia and other illnesses and may not survive, the sickle-cell mutation allows so many people to avoid the harmful consequences of malaria that it is maintained in the population. When malaria is no longer a population-wide threat, the sickle-cell gene loses its advantage and starts to disappear. In this case, Americans of African descent still carry the mutation more than non-Africans, but much less frequently than West Africans do. Like skin color, as well as facial features and hair texture, the mutation, which protects against a deadly disease but in some cases deforms red blood cells, is an adaptation to a certain environment that dissipates when a population leaves that environment. Thank you and have a happy and safe Holiday!